Nokia’s Design by Community project has been running for seven weeks, and has now closed. We first wrote about the project in the article ‘Help design the Nokia phone you would like to see made‘. Over 74,000 votes were received, The winner will be turned into a design concept render and revealed exclusively on the Nokia Conversations Blog, later this month. 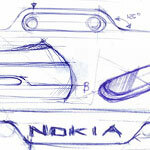 The Nokia Design team are currently working on sketches of several designs, which will be presented for voting in a few weeks. Once that vote has taken place, the winning design will be made into a fully rendered device. Also remaining, of course, is a name. Votes were called on for the name about two weeks in, and the submissions are being looked at now. The plan is not to actually make the product, Nokia’s Design by Community is more an exercise in collaboration sprinkled with some future thinking. Operating system: open source operating system with unlimited multitasking; DbC OS 1 sports temperature and location sensors so your device constantly monitors whereabouts and the local conditions; Device-based storage is supported; the majority of OS functionality responds to touch control.